Mumbai, April 2 (IANS) Actor Shreyas Talpade has said he would love to feature in Gujarati films. The actor was interacting with the media at a party organised to celebrate success of Vipul Mehta's Gujarati film "Chaal Jeevi Laiye". 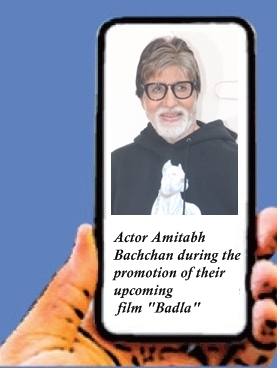 Chennai, April 1 (IANS) Megastar Amitabh Bachchan sports dhoti and gamcha in the first look of his character from upcoming Tamil film "Uyarntha Manithan", which marks his Tamil film debut in a full-fledged role. New Delhi, March 31 (IANS) Actor-producer Rana Daggubati says he is truly passionate about acting as it allows him to tell stories on screen. Mumbai, March 31 (IANS) Tamil-Telugu actor Vishal Krishna, known to hurt himself doing daring stunts, has done it again. New Delhi, March 29 (IANS) Around 100 members of the Indian film fraternity on Friday issued an appeal urging Indians not to vote for the Bharatiya Janata Party (BJP) in the upcoming Lok Sabha elections. Amaravati, March 28 (IANS) The Andhra Pradesh High Court on Thursday stayed the release of controversial movie "Lakshmi's NTR" till April 3. Mumbai, March 26 (IANS) Tamil film actor Vishal Krishna, Vice President of the Tamil Film Producers' Council (TFPC), feels it is time to take the strongest action against people in positions of responsibility who speak disrespectfully of women. Mumbai, March 26 (IANS) Actress Tara Sutaria will be seen starring opposite debutant Ahan Shetty in the upcoming Hindi remake of the 2018 Telugu film "RX 100".